Despite the restrictions on their work and actions, the economists of the Soviet period produced a great deal of bold and important work. With the erosion of the old Stalinist controls, economists in the Soviet Union themselves became very interested in the history of their profession, not least in order to find authentic voices that might offer reinforcement or counterpoint to the policy analyses and recommendations with which policy makers in the transition countries are today being bombarded. 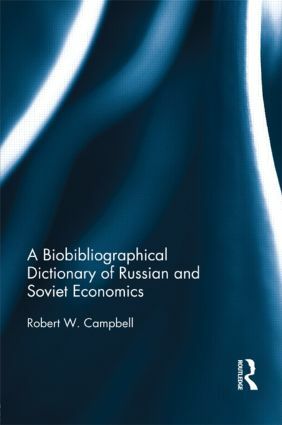 This major new reference work pulls together many years of research in order to present a bio-bibliographic dictionary of Russian and Soviet economists, many of whom have previously had no coherent record compiled of their careers, achievements and wider significance. Through exploring this rich tradition of economic thought, we can go some way in understanding the role of economists in the functioning of the Soviet system, as well as bringing previously forgotten work to light, raising new questions, and providing a memorial to those who suffered as a result of the system. This hugely detailed and important new volume takes into account all the nuances of the story of Russian and Soviet economic thought, such as regional issues, the reform and transition to a market economy, and the economic output of non-economists. Featuring nearly 500 entries, and including a detailed contextual introduction, this landmark volume will be a vitally important reference work for all those with an interest in the history of economic thought, the history of economics and Russian and Soviet history more generally. and the problems of transforming them into market economies. His publications include 18 books and monographs and more than 40 articles and chapters in books.